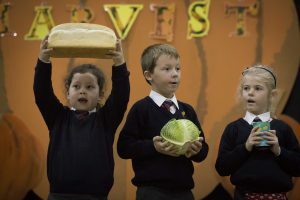 Pre-Prep Headteacher Mrs Karen O’Connor said “Our Christian tradition was celebrated today during our Harvest Assembly, as we paid homage to one of the oldest traditions in Britain – the Harvest Festival. Following the service a collection raised £700 to support Great Ormond Street Hospital, a national charity nominated by the pupils. Earlier this month Heatherton pupils embraced the Harvest spirit of giving and visited a local residential care homes to entertain and socialise with the residents.